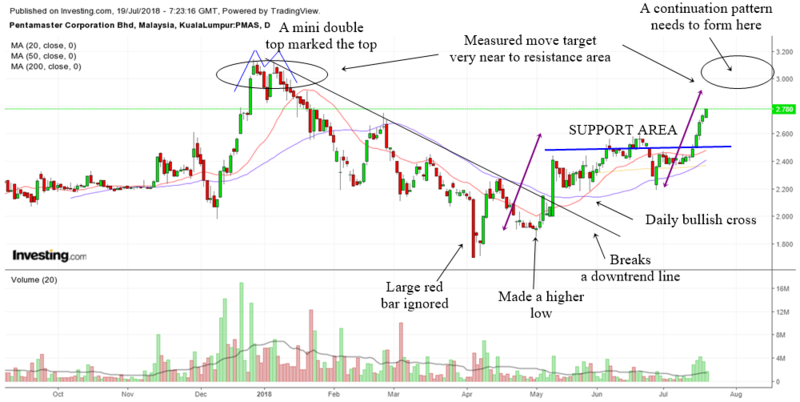 A darling of the Malaysian investor community last year, this stock has started a new daily stage 2 uptrend but it is likely to meet resistance at the former highs. Now, when you hear the word "resistance" it does not mean that the trend will end straightaway. The law of physics states that a trend in motion tend to stay in motion. A look at the chart of Pentamaster tells us that the daily uptrend is still intact with lots of support underneath. Just a note of caution to those who want to buy now.... you may see resistance nearby at the former highs. What has happened in Pentamaster itself can actually be a great case study for the trader. Back in early January 2018, the stock topped out after a rapid rise up. It might not be evident to the casual observer. But to those who are skilled in the art of spotting a top, a mini double top was actually forming. You can see how chart patterns such as the double top can be meaningful in helping the trader to spot a top. Pentamaster declined tremendously after the appearance of this chart pattern. After a long decline, Pentamaster formed a classic bottoming formation. Those who study the art of spotting a bottom will no doubt be able to see it coming. The first sign was the stock formed a higher low. It then broke above a downtrend line. The fact that the stock formed a large red bar back in early April and the red bar was quickly ignored told us that the bulls were taking back control. If it was so bearish, there should be more falling after the appearance of the bearish red bar. I must say that the moment that the stock broke above the downtrend line, the stock shot up higher immediately. Some classic break the downtrend line shoot up occured in the stock and from there on the stock had a nice uptrend. A bullish cross in the daily chart also told us that the trend is up now. At this very moment, the trend for this stock is up. I always think that stocks that are in an uptrend tend to be able to go up further in the longer run. However, a look at the stock chart also tells us that there is some resistance overhead. Therefore, those who wish to buy now may encounter some selling as the stock nears the previous double top resistance. If we take the measured move target that I have drawn on the chart, we can see that the target is quite near to where the resistance area is. All this does not mean that the stock will hit resistance and straight away drop. What it means is for traders to exercise caution as resistance is near. There is bound to be some selling by people who lost money at the double top. 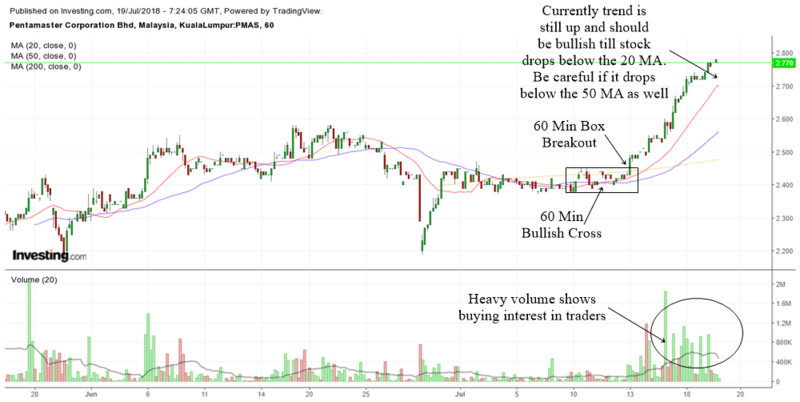 Perhaps it might be good to see the stock consolidate a bit as it reaches the double top area and then form a continuation pattern such as a box breakout. Then we can be confident that Pentamaster can breakout above the previous high to make another all time high. On the other hand, if Pentamaster hits resistance and then declines, there is ample support below. I have drawn the support area using the blue line. That will be an area for swing traders to build up their positions because if the support holds and then stock bounces back up, it will provide a nice swing trade. Let us now check the 60 min chart of Pentamaster. All looks good in this chart at the moment. There was a 60 min bullish cross. And then a box breakout which gave traders a nice setup. Currently, the stock is still in a nice 60 min uptrend with the stock trading above the rising 60 min 20 MA and the 50 MA. One should continue to be bullish on this stock short term as long as it stays above the 60 min 20 MA. Be careful if it drops below the 20 MA as it might signify slowing momentum. And if the stock drops below the 60 min 50 MA, then we have to be very cautious. The trick my friends in trading stocks is to buy low and sell high. Selling on the way up is perhaps the best way to make some money for traders.